Sam Hill (1857–1931), founder of the Maryhill Museum of Art, was one of the most colorful and influential figures in the Pacific Northwest in the early 1900s. He was a successful businessman, world traveler, builder of monuments, and early advocate of paved roads. Hill commissioned the Maryhill Stonehenge Memorial to honor World War I dead from Klickitat County, Washington. The monument was dedicated in 1918—while the war was still rampant—and completed in 1929. He was also responsible for the construction of the Peace Arch in Blaine, Washington—recognizing the close ties between the United States and Canada. It was dedicated in 1921. At Maryhill, Hill employed engineer Samuel C. Lancaster (1864–1941) and spent three years and $100,000 of his own money building experimental roads on the property—so that skeptics could see the type of highways for which he was advocating. His activism eventually prompted the creation of state highway departments in Washington and Oregon. He was also a force behind construction of the Historic Columbia River Highway and the Interstate Bridge between Portland, Oregon, and Vancouver, Washington. The permanent Sam Hill exhibition at Maryhill Museum of Art includes some of Hill’s personal possessions, items acquired during his travels, and photos and mementos related to his favorite cause, the Good Roads Movement. Visit the museum’s Sam Hill Gallery to view black and white prints showing both construction photos of the highway and early scenic views of the Columbia River Gorge. Most of the images are drawn from Sam Hill’s personal photo collection, which is housed at Maryhill Museum of Art. 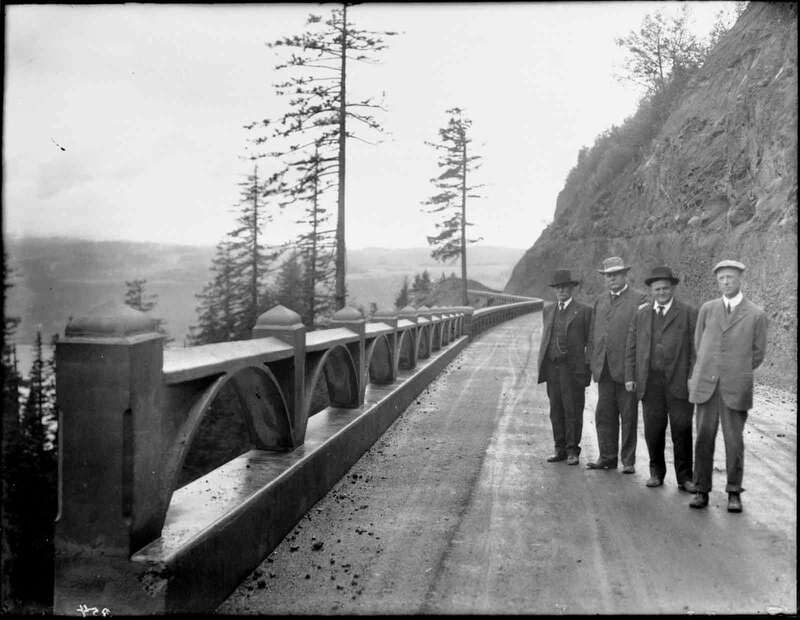 Image at right: Unknown photographer, Unidentified man, Sam Hill, J.C. Potter and Amos Benson standing on the Columbia River Highway, c. 1915; Collection of Maryhill Museum of Art.